A few days ago I wrote a short post about the Fast & Furious affair. I said I’d followed it only from afar, the whole thing seemed sort of ridiculous, and I never planned to write about it again. those guns to the drug lords and other higher-ups who used them to arm their gangs. Then, via rank incompetence, ATF lost track of the guns, one of which was eventually used to kill ATF agent Brian Terry. But Fortune’s Katherine Eban has a long piece about F&F in this week’s issue, and if she’s even close to right, then everything I thought I knew was wrong. F&F wasn’t a gun walking operation. Nobody deliberately allowed guns to be shipped to Mexican drug lords. Nobody stupidly lost track of the guns. It just didn’t happen. Eban’s story is too long and detailed to be excerpted, but when I started reading I couldn’t stop. My mouth was hanging open the whole time. 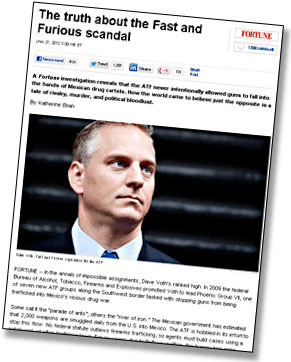 The real story, according to Eban, is about weak laws, incompetent prosecutors, juvenile bickering within the ATF’s Phoenix division, a CBS reporter who basically got played, and a craven bunch of managers and politicians who decided to throw the operation under the bus because it was too politically risky to just tell the truth. If you have even the slightest interest in this case — I’m talking to you, Jon Stewart — you need to read Eban’s story. Now.